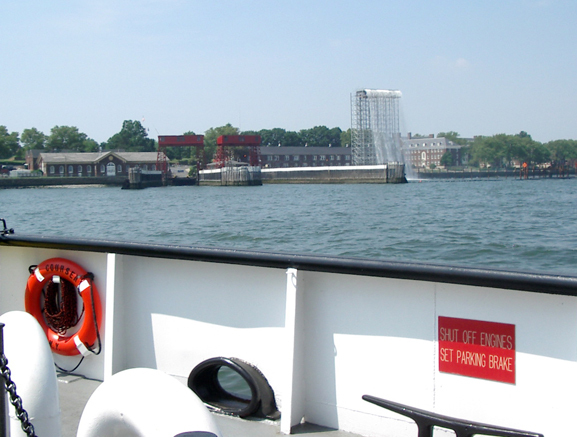 One of the four NYC Waterfalls is adjacent to the entrance dock of the island. The sound of dance music filled the air from speakers set up in the clearing where a performance troupe called GrooveHoops set up camp with decorative hula hoops encouraging all comers to indulge their limb-wiggling, hip-wriggling hoop dreams. 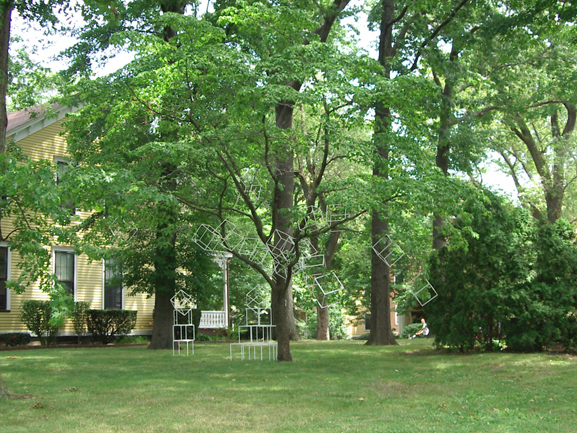 We took in the sculpture dotting the verdant lawns of the historic homes in Nolan Park, glimpsed more sculpture at the InSite house and found our way to Emergence: Creative Pioneers in Uncharted Territory for the participatory art show that brought us to the island in the first place. Outside the Emergence house we came across three exhibits which integrated the immediate surroundings. The information provided for each comes directly from the didactic labels. Concept: Over nine weeks, the structure will be gradually insulated with salvaged plastic bottles, re-purposed as receptacles for organic life. 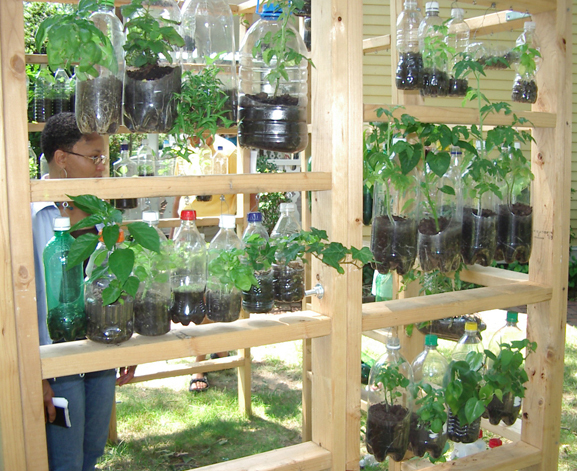 Within each bottle, living plants are cultivated in either soil or water.The dialogue and interaction initiated through the construction of the homestead in tandem with planting, cultivating, and harvesting is integral to sustainability. The collaboration between artists and audience patterns a simple model of a community. Participate: Viewers are invited to donate plastic bottles and participate in the planting process. At the end of the summer, the wood skeleton will be recycled and the plants will be given away; transplanted to a new place in which to grow roots and emerge. The Triangle Project, with its deviation from plan, embraces the mercurial nature of work which is physically engaged by its viewers. Concept: Artists from Copenhagen, Denmark and Istanbul, Turkey, hand carried these white cubes to from Copenhagen to New York City. The purpose of this act is to challenge airport security’s intelligence and common sense. With the curbes securely in the hands of these artists, they will build a structure that stands for power and enlightenment. They will arrange the squares to form the base of the pyramid, and continue to build it together to achieve the same goal. 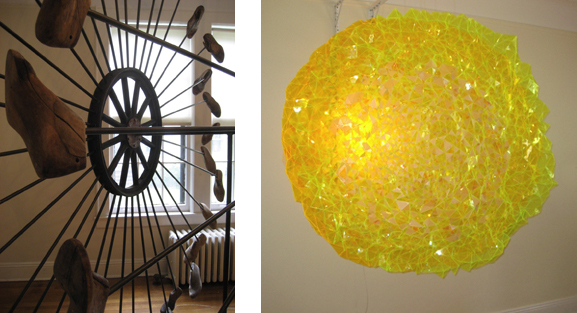 Concept: Donated, used and recycled fabric is woven into the installation that creates fantastical environment. Textiles can reference powerful, personal and collective memories where they serve as a medium to explore the rich cycle of creation and exchange. 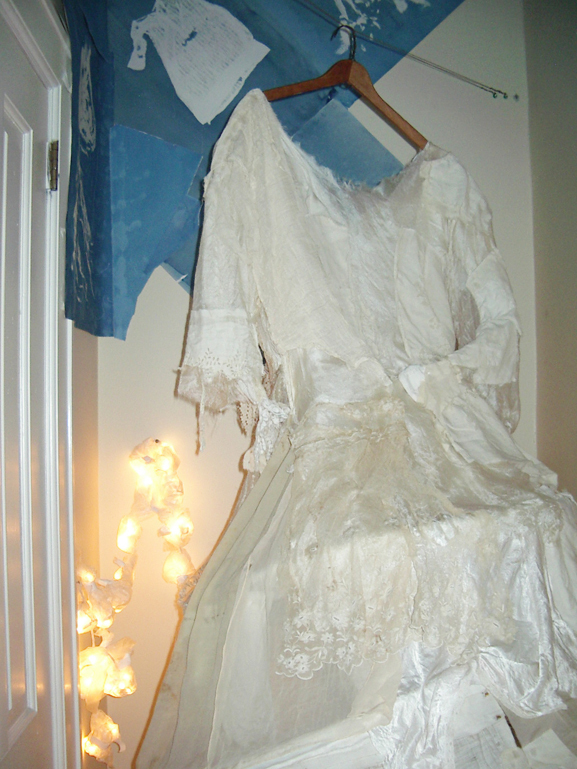 Participate: Viewers are invited to bring pieces of fabric (this could be in the form of old clothing, curtains, etc.) cut them into strips and add them to the off-loom weaving. 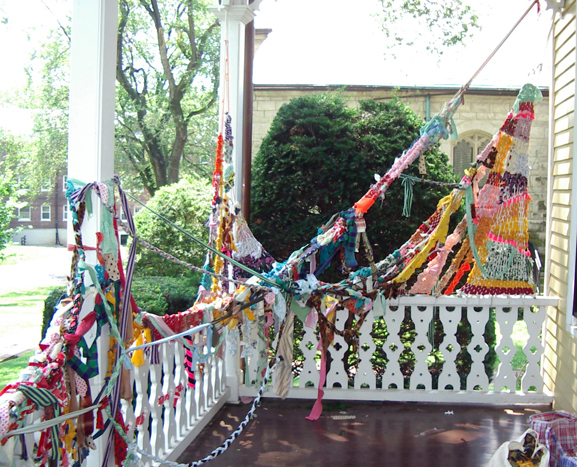 Fabric is also supplied on the porch for weaving. Weaving is simple and intuitive (over one rope, under the next and so on) They are encouraged to pay attention to color blocks, shaping and shading. Concept: It is an on-going project made of an evolving set of fluorescent tiles (Diamonds) assembled in different configurations to create a variety of mobile sculptures. 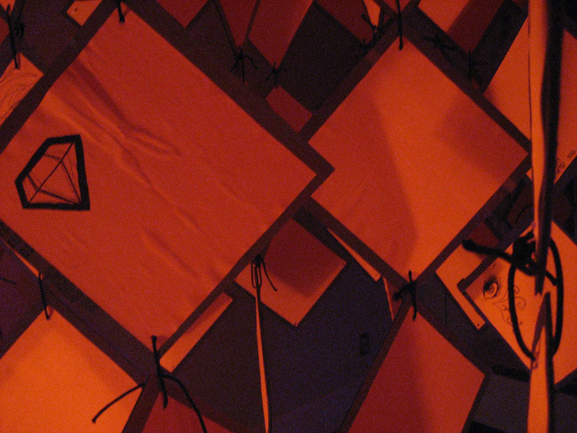 The original setting for the installation is hung from the ceiling of a dark room lit only with black lights. Concept: Fork It Over is about the cost of the current war in Iraq and Afghanistan. It deals with the literal sense of the price of the war (the most recent numbers indicate $822 billion, with expectations of it surpassing $1 trillion), but also with the cost on the lives, livelihoods, and quality of life of all of us. Military families mainly carry this burden. This war is quickly becoming one of the most expensive wars the US has ever fought, with the inflation-adjusted rate of WWII being the only larger amount. We are each personally getting “poked,” and asked to shell out for a war that could be seen as unconstitutional. 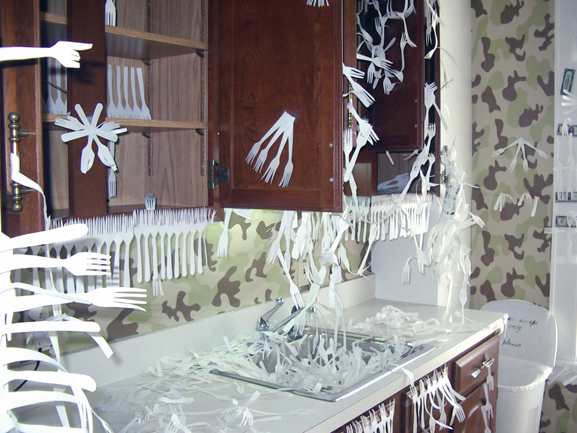 Is it possible to fill the room with 822 billion of these paper forks? Or even 1/1000 of this figure? (Each fork representing a $1000 note.) 822,000,000 is a number that is impossible to imagine as a number that could actually be represented– and that is part of the point of this installation, it is impossible to create this amount of a simple handmade object. Having the content of this installation be about the Iraq war is important because it is situated on a former military base. Site specificity is a central aspect of my work, therefore the fact that the space that I am using is a kitchen space, and the fact that it is on a military base are both drawn out in the piece. 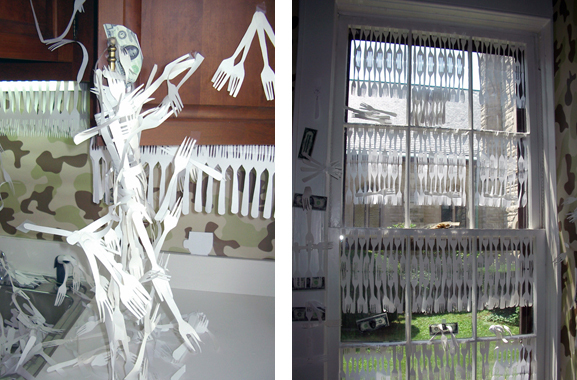 Participate: Visitors are encouraged to add to the installation by using the provided scissors to make more of the fork cutouts. The forks can be placed anywhere in the room. Viewer participation is important because we all, in some way, are bearing the cost of this war. Anne Arden McDonald’s ethereal installation. 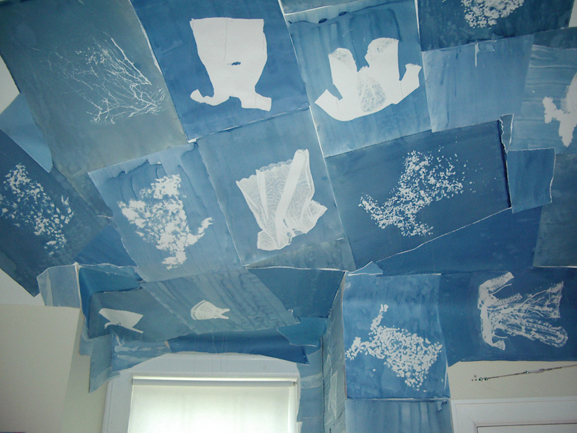 Concept: Cyanotypes from contact prints of Victorian childrens’ dresses, doll dresses, lace, paper, and hair fill the ceiling to create an environment of delicacy. Plumb bobs contributes to the duality between weight and weightlessness. The installation references the importance of an era and general nostalgia. Participate: Viewers are welcome to enjoy mood of the room, sit on pillows and draw on the paper covered floor, and scattered sketch pads. A dress is suspended in the air that invites viewers to crawl underneath it. The plumb bobs also function as a drawing tool. Viewers can gently move the string and let momentum draw for them. Merging with the tranquility of the Arden installation that shares the same room is Michael Alan’s mad cacophony. Concept: Existing drawings envelop the space and encourage the creation of new drawings. The installation is a mental link to a playful yet dark world of childhood curiosity and interpretation. The overall piece taps into the energy of a children’s room, where you are free to draw whatever you understand and don’t understand. 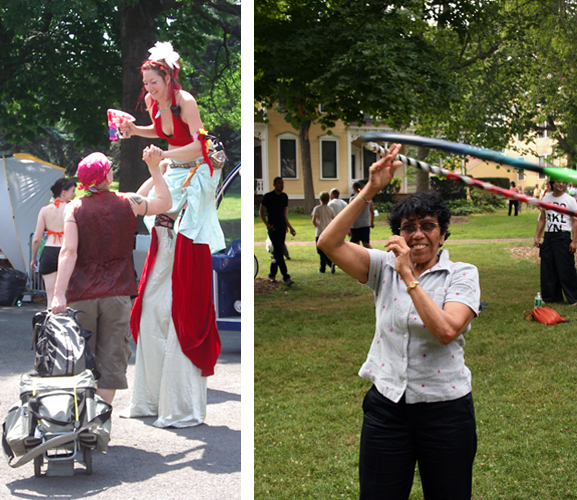 Participate: Experience the Draw-a-thon on Governors Island in a concentrated participatory setting. Nick Greenwald and Matthew Brennan from Draw-a-thon Theater have put pieces in from our collective. We will perform a costumed show and hand out paper and pencils to spectators on Sunday, June 29th at 4:00 PM. Come draw! “True Mirror” photo from Emergence website. Concept: The True Mirror is an amazing new look at yourself through a most familiar medium – the mirror. However, unlike traditional mirrors, the True Mirror reflects without reversal, so for the first time what you see what everyone else sees. The differences are not just physical, as what you say with your face is right and left sided, so your expressions and underlying personality change when they get reversed. Its the real “you” looking back! Participate: As you walk past the row of True Mirrors, notice some funny physics – you are always in the center of each True Mirror! Hold some writing up – can you read it? Now look into your eyes – who is that looking back? Try a smile – can it be real for once? Do you feel crooked (don’t worry its an exaggeration). Compare to the side panel – notice how its familiar, but flat and uninspiring. Think of how mirrors have been doing this your whole life! Concept: This piece is a giant geometric puzzle that is an open playing field where the viewer can exercise their vision and play a part in creating a large-scale installation. 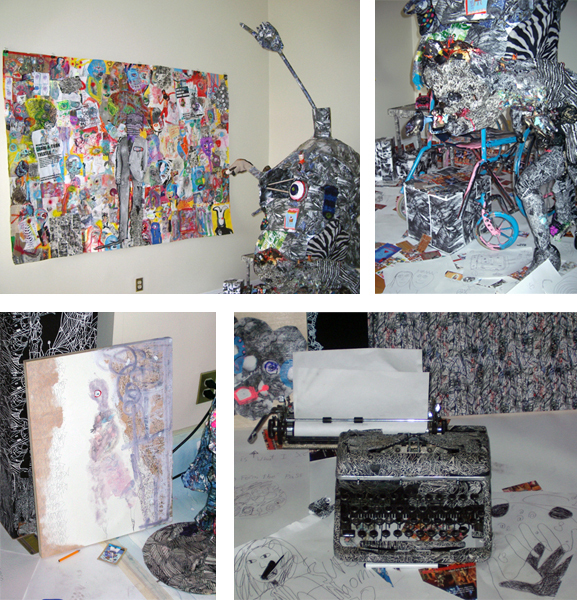 It is a collaborative art piece that grows, evolves, and takes on new meaning with each additional input and feeling. It grows like a bee hive as new combs are added, symbolizing the creative and constructive potential all of us possess. 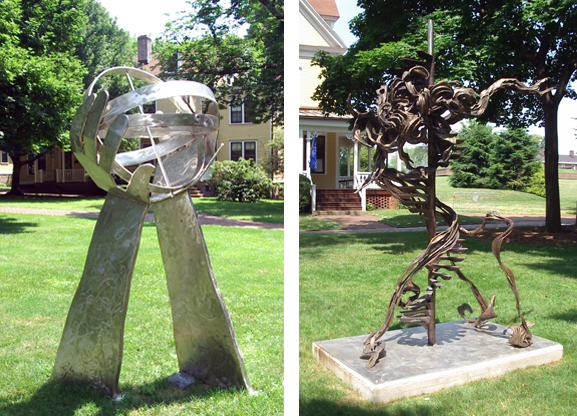 Participate: The installation has several existing pieces that are already in place. 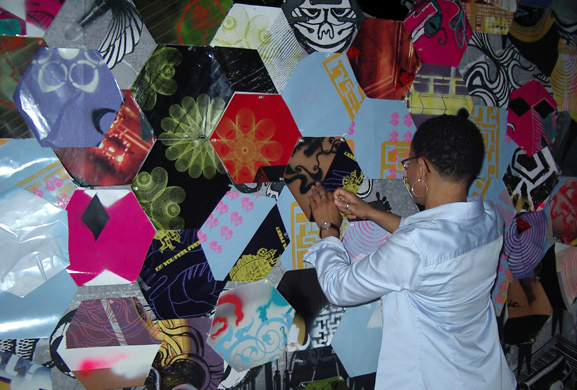 Viewers can place hexagonally-shaped pieces, roughly 12 inches in diameter, with varying arrangements directly on the wall with pushpins. From that point forward, the people that venture to the piece will be able to activate it in their own way. 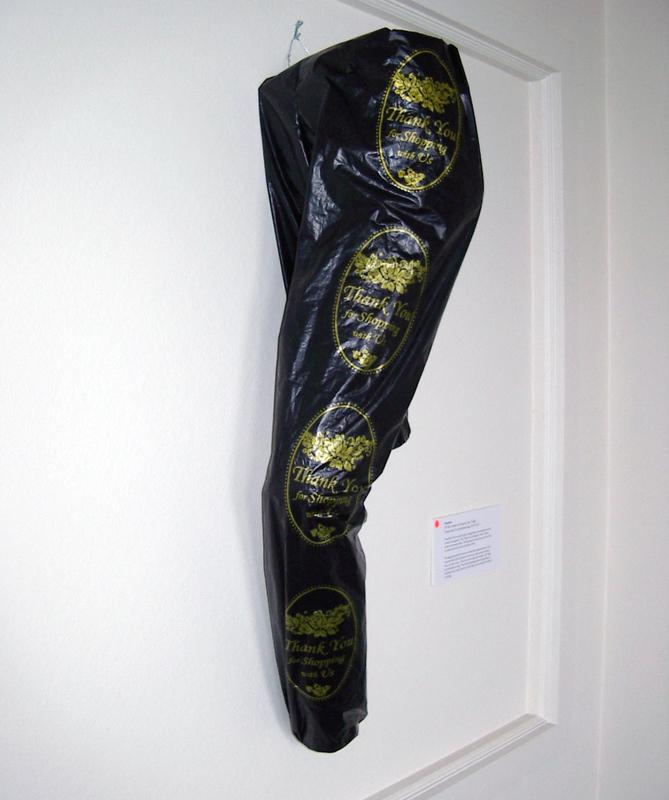 “Rainpants,” (recycled plastic shopping bags) urban cyclist, KD Derr’s riff on consumerism. We took in a short film (shown at CUNY’s Institute for Sustainable Living expo) on the wonderful possibilities and obvious perils of urban bicycle riding, with suggestions for creating a safer biking culture. Also featured was a display of artworks and initiatives for participants to vote on for the best-of-show. We ambled across the bunkered fort to discover City of Dreams Mini Golf, each of its nine holes designed by a different artist to reflect our city. 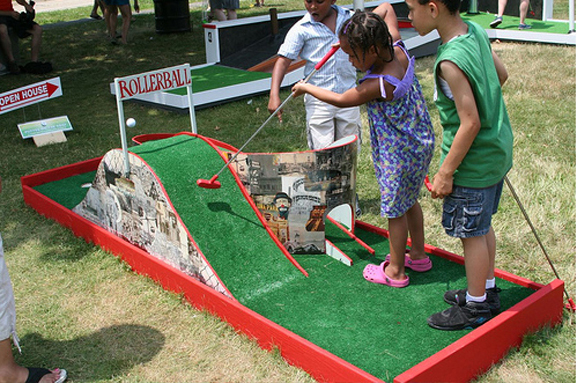 Though the mini-golf course is open to adults as well, some of the Liliputian-sized holes make it best for the kiddies. After all the walking we decided to rent a surrey and pedal around the island, whereupon we came across what appeared to be an African Spurred Tortoise, and a powerful recycled metal sculpture, The Agony of Man. 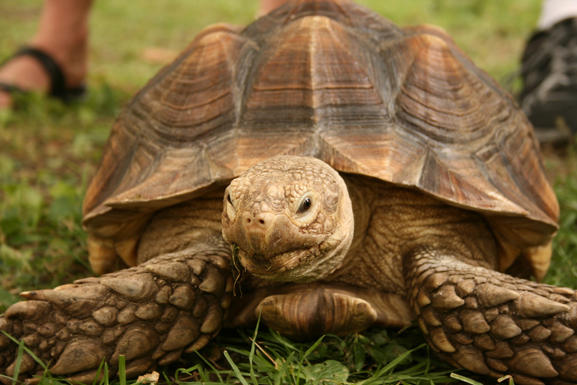 This chelonian cutie caused quite a stir. 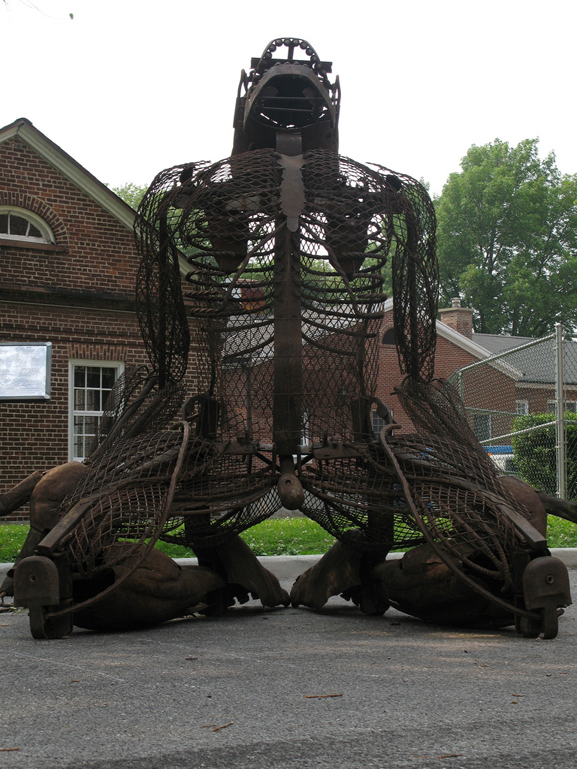 Neal Borowsky’s commanding piece is made from steel salvaged from many New York historical sources such as the original benches from Madison Square Park. Both photos, Figment* flickr photo pool. 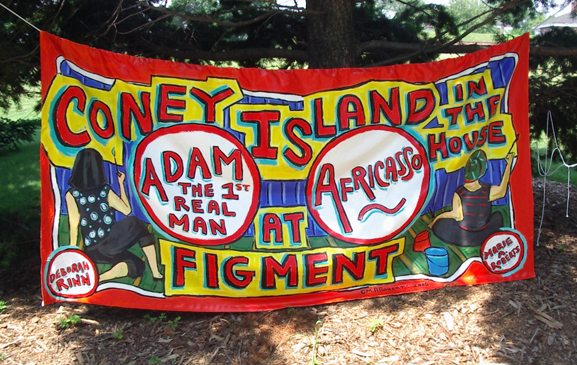 Though the Figment festival is over, Governor’s Island remains open to the public on Fridays, Saturdays and Sundays until October 12; mini-golf through October 4; In-Site is open through October 1 and Emergence is open Saturdays and Sundays only until July 26. In addition to two or four-seater surrey rentals, bikes are available for rent as well ( though hour-long bike loans are free on Fridays.) With the amazing waterfront views, picnic grounds and interesting activities, it’s a great day excursion and absolute testimony to the power of green spaces and public art to make urban life more livable. This entry was posted on Thursday, July 3rd, 2008 at 10:36 am and is filed under Arts, Events and Music. 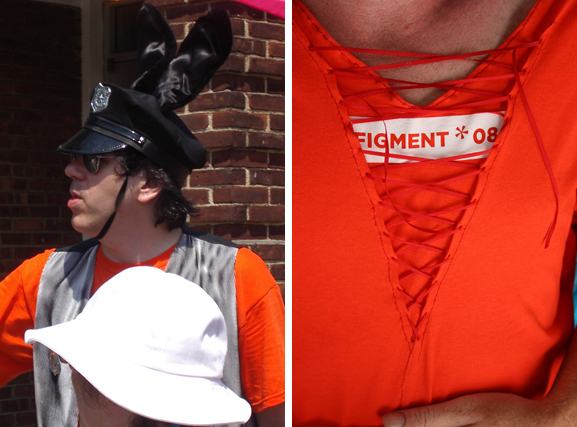 Tagged: Emergence Show, FigmentNYC, Governor's Island. You can feed this entry. You can leave a response, or trackback from your own site. Tremendous! What was I doing last weekend? ?